Brown Communications got a grudging pat on the back from AdRants' Steve Hall for their latest self-promotion on their storefront billboard. 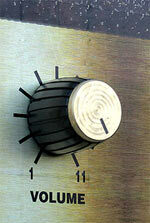 This one features an amplifier volume switch that goes up to 11. Brings back memories of Spinal Tap, the great mockumentary that showed Christopher Guest how it's done. In Spinal Tap, the heavy metal rocker enthuses about the fact that after fudging the number on his amplifier, it now goes "one louder" than the others. Nice to see the other Saskatchewan marketing/digital/PR blogger get some attention. Nice one, Derek. Confesion: I have a thing for signage. I rave about good signage, and contantly harp about the perils of bad signage. When I see a new stop sign - without warning signs about the change - all I see is a lawsuit. When I can barely navigate a parking garage because the signs are hard to read, hard to understand and poorly placed, I vow not to return to that mall (well, for a few months, anyway). So, I'm a signage fetishist. I'm not ashamed. I was particularly pleased to come across Josh Hallett's photos from an Ikea. The signage - like the rest of the store and product design - is simple, elegant and extremely functional. The spotlight trained on the arrow on the floor is a particularly nice touch. Thanks for sharing, Josh. His Flickr photos. Check his blog, too. Tangential linking: For a different take on design, check out Ross Howard's post about ambient signifiers, and how the use of sound on the Tokyo rail system suggests ways to subtly help website visitors find their way (and no, Ross isn't suggesting musical websites). Here's a Flash site that makes the most of low-res graphics and the public's expectation that milk will be marketed in a wholesome way. 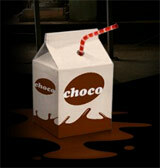 Instead of testimonials about health and bone density levels, mechantchoco.com (warning: site launches with sound) uses a horror film motif to reveal the sad fate of kidnapped chocolate bunnies, ducks and bears that are ground up and turned into chocolate milk. The choppy, cheap horror-film look of the graphics works well. Selecting different options, you can see how the chocolate critters were bashed, ground and micro-waved into pieces before being transformed into chocolate milk. 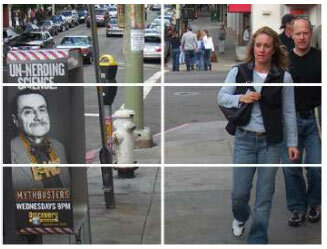 The campaign earned BBDO Montreal a Cassie grand prix. 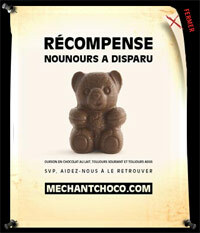 For six weeks in 2005 Quebec was peppered with posters for various "missing" chocolate animals, prompting teens to visit the site. Sales went up 17%, says the Globe and Mail. 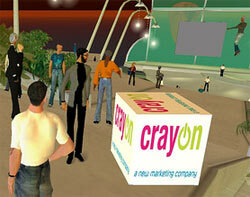 In the right margin of this blog, you'll find an ad aimed at Canadian public relations folks. I haven't run ads here before, not from a misguided sense of the purity of my ideas, but because I didn't have the time and energy to pursue it. Well, CNW Group sought out several Canadian public relations bloggers for a promotion of a media monitoring tool, so you could say opportunity came knocking. The result, for those who click through to CNW, is an online game that has a PR flack trying to protect the client from whatever objects coming falling from the sky. Full credit to them for recognizing that advertising has to have some intrinsic value (in this case, a bit of entertainment) for the audience, especially an audience that is as jaded toward traditional marketing as your average PR person is. Not wanting to host anything on the blog I wouldn't try myself, I checked out the game, and it's both safe for work and sort of fun. The game animation is okay, but I liked best the descriptions of crises that are dropped on the poor PR person in the game. David Jones has a comment recognizing CNW for trying something different. Much thanks to Michael O'Connor Clarke for being the go-between for several months while the idea took shape. Colin McKay is also selling his soul, as is Chris Clarke. Knowing how much we bloggers like to talk about ourselves and our blogs, I suspect this campaign will get as much traction from the posts written about it as from the ads themselves. Now it's personal. The Saskatchewan Roughriders are used to being taunted by opposing players and coaches. This time, the Calgary Stampeders are trying to neuter the 'Riders' mascot. Gainer the Gopher has been told not to show up at McMahon Stadium for this weekend's CFL playoff game. The Stampeders are worried that he'll take away their home field advantage by getting too many 'Riders fans in Calgary riled up. 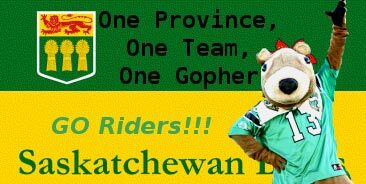 The Roughriders' main marketing theme this year has been 'The 13th Player'. In TV ads, the colour commentator points to an overzealous fan in the stands, who made a difference for the team. 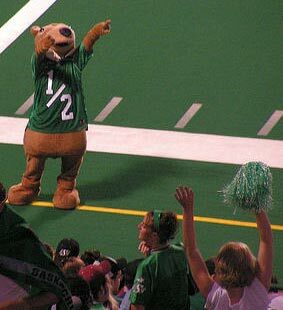 Of course, Gainer is also called the 13th Roughrider, helping fans pump up the players and rattle the opposition quarterback when he's trying to call a play on the field. The challenge this weekend for the thousands of 'Rider fans in Calgary, will be to rattle the Stampeders, with or without a mascot. Anyone who's checked the number of expatriate Saskatchewanians in Alberta knows they've got the numbers to do it. And now they have the motivation. It seems that at least once a year a CFL team tries to snub Saskatchewan, making the fans that much more devoted to their underdogs. This year, it was Calgary's turn to make a shabby move (as if enticing away so many of our skilled workers over the years wasn't insulting enough), and the fans are once again solidly behind their Green and White. Thanks to Jordon Cooper for the photo of Gainer.